You have to be super quiet during the performances, so I wasn’t able to take any photos while the actual playing took place since the camera shutter is too loud and would have been too much of a distraction… Ah well. Honens International Piano Competition is one of the worldʼs most prestigious events of its kind and Canadaʼs leading presenter of music for piano. It has a unique voice in the world of music competitions by identifying and nurturing “Complete Artists” – musicians for the 21st century, with audiences for the 21st century in mind. 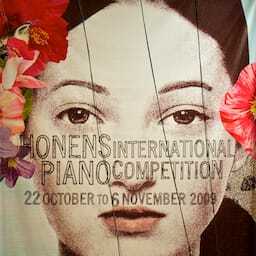 The Honens Competition takes place every three years in Calgary, Alberta, Canada. If you check out the Honens website, you can listen to audio from all the performances, including Natacha’s performance from tonight! Honens Piano Competition 2009 was published on Friday, October 30, 2009 at 11:45pm MDT by Daniel Menjívar and last updated on April 11, 2018 at 9:30pm UTC .